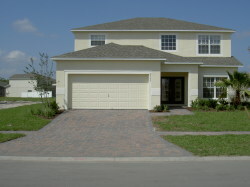 The executive two storey family home is built on one of the premium south facing plots overlooking a lake on Cumbrian Lakes, Kissimmee, Orlando, less than 15 minutes to all the major Disney attractions and central for all the other attractions in and around Orlando. Cumbrian Lakes is a small executive gated community off Poinciana Boulevard of just over 300 houses set in a conservation area of 120 acres with beautiful landscaping around the houses. There are several lakes with fountains, the larger of which has a paved nature trail surrounding it. 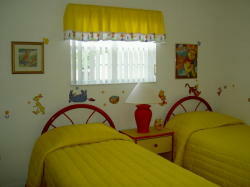 A communal children�s play area is provided and there are plenty of open spaces. 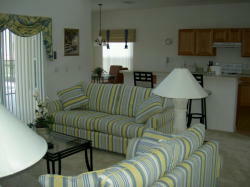 Our Orlando villa offers 2,475 square ft of fully air conditioned flexible living space. It consists of five large double bedrooms including one master suite, a second master bedroom and two Disney themed bedrooms, two spacious sitting areas, two dining areas and a fully fitted kitchen. The 27� by 11� pool is fully screened and has an integrated raised spa. The pool and spa can be heated if required and has underwater illumination. 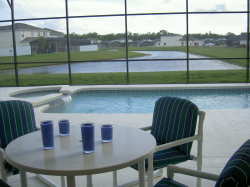 The large extended poolside equipped with luxury patio furniture overlooks a lake and includes a large covered lanai for protection from the sun. The villa has luxury facilities and equipment to attend to all your likely holiday needs including games room with full size pool table and foosball table, televisions, Hi Fi, DVD, video and Sony Playstation 2. Quality prevails throughout from the brick paved driveway to the ceramic tiled walls and floors in all wet areas. You will not be disappointed with your choice of villa. For keen golfers the villa is less than 15 minutes from 6 golf courses including Greg Norman's Champions Gate 36 hole award winning course and the Disney courses. For keen shoppers, the designer malls are nearby. For the comfort and safety of all guests there is no smoking permitted within the villa.